During the final week of 1971, The Band played four legendary concerts at New York City’s Academy Of Music, ushering in the New Year with electrifying performances, including new horn arrangements by Allen Toussaint and a surprise guest appearance by Bob Dylan for a New Year’s Eve encore. Select highlights from the concerts were compiled for The Band’s classic 1972 double LP, Rock Of Ages, which peaked at No. 6 on the Billboard 200 and remains a core album in the trailblazing group’s storied Capitol Records catalog. For the first time, all four of the concerts’ multi-track recordings have been revisited for Live At The Academy Of Music 1971, a new 4CD+DVD collection to be released September 17 by Capitol/UMe. The expansive new collection features new stereo and 5.1 Surround mixes, including 19 previously unreleased performances and newly discovered footage of two songs filmed by Howard Alk and Murray Lerner. 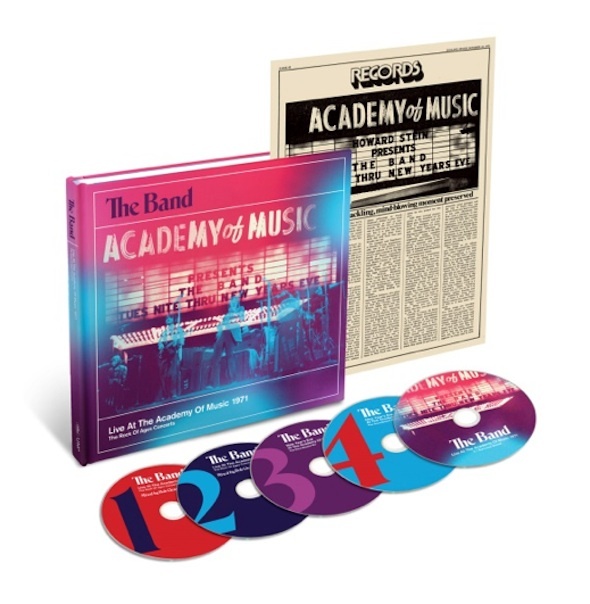 Live At The Academy Of Music 1971 takes a deep dive into The Band’s historic shows for a definitive document of the pioneering group’s stage prowess at the apex of their career. On the same date, the collection’s first two discs will also be released as a 2CD set. Live At The Academy Of Music 1971 is presented in a deluxe, 48-page hardbound book with previously unseen photos, a reproduction of Rolling Stone’s original Rock Of Ages review by magazine co-founder Ralph J. Gleason, an essay by The Band’s Robbie Robertson, and appreciations of The Band and the set’s recordings by Mumford & Sons and Jim James of My Morning Jacket. The collection’s first two discs feature performances of every song played over the course of the four concerts, and the New Year’s Eve soundboard mix on discs 3 and 4 puts the listener in the room for that entire legendary night: Uncut, unedited, taken straight from the master recordings and presented in full for the first time. The set’s DVD presents the tracks from discs 1 and 2 in 5.1 Surround, plus Alk and Lerner’s filmed performances of King Harvest (Has Surely Come) and The W.S. Walcott Medicine Show. View full track listing here. Some things change, some remain the same. For her much-anticipated second album (the follow up to the 2011 debut Adelphi Has To Fly), the 23-year old singer, guitarist, ukulele and concertina player Lucy Ward delivers a finely-tuned synthesis of original and traditionally arranged material. Production is again by Stu Hanna (of acclaimed folk duo Megson, both of whom also sing and play here). There, however, the similarities end as the new album - Single Flame - finds Lucy organically broadening her musical palette whilst remaining firmly rooted in a folk tradition that gives shape and form to her sound. Balancing the contemporary and the traditional is never an easy act to achieve but Lucy does it with a natural gift and flair. Her songwriting creates the kind of original songs that you think you’ve heard somewhere before – on an old folk recording or the radio; a testament to the quality of her lyrics, melodies and ‘hooks’. As a child and in her early teens, Ward grew up in a household where she heard recordings by the likes of Melanie and Bob Dylan and absorbed their lyrics and impact. The album opener I Cannot Say, I Will Not Speak has the lines “they sang the songs of Safka / Candles in the rain”. “The idea behind this song” she says “was how a generation of people sung songs of peace and protest in the 1960’s and yet peace has still to come. The lyrics”, she continues, “were born out of imagining there was just a candle left in the rain, a single flame, a ray of hope that we must protect because it only takes one flame to start a fire”. Her song For The Dead Men made a first appearance as a single in January 2012 and was subsequently used in the soundtrack to the award winning director Kim Hopkins’ documentary film Folie a Deux ("Madness Made of Two"), which premiered at the International Documentary Film Festival in Amsterdam in November 2012. It’s a moving song and performance. “I wrote this song for the dead men” she says. “The dead men are all the people who marched before us, campaigning for justice. The dead men are also those who are apathetic to what is happening around them and their power to affect it. Lastly, the dead men are all those who are left to fall off the thin end of the wedge.” It’s a song about time passing; how we react to it, how we shape our history or allow it to shape us. What we do to stand up for the rights of ordinary people. “Stand up and take to the streets / they can’t ignore us if we all choose to speak”. Ward’s songs are compassionate and insightful. They’re also capable of seeing beyond a single event, no matter how emotional and traumatic, to the wider context. One of the most striking original works here does that: it’s called The Consequence and its about violence within the domestic environment and how it destroys and changes the nature of family and home forever. “Shame, Shame, Shame / upon this house” - the words echo in this spare and simple but beautifully sung piece. “I wrote this song after Shafilea Ahmed’s parents were imprisoned for life for murdering their daughter. In the sleeve notes I haven’t said this as I feel that it could be read in different ways; honour killing, murder of a partner”. These kinds of acts are not confined to any one community. Moving to the upbeat, Marching Through The Green Grass is a Ward and Hanna arrangement of a song also known as the Soldier Boy or Sailor Boy. Collected in the Appalachians by the folklorists Cecil Sharp and Maud Karpeles, the song comes from a time long before the birth of the modern army and the advent of combat soldiers of both sexes.“ The recording includes a tune that Stu and I wrote together”. The performance is a feisty, strident comment on soldiering. Lord I Don’t Want To Die In The Storm is a traditional song, collected in America by Cortez Reece. After struggling to source a tune for this song, Lucy and Stu decided to write their own. The results are a haunting, doleful piece of minimalist Americana. Lucy’s song melodies are as memorable and engaging as her lyrics. Songs like For The Dead Men, Honey(about pure and natural beauty), The Last Pirouette (a song on the end of the world, based on a poem written by Lucy’s father in 1983), Rites Of Man (a lament for Mother Nature) and Ink (a lyric based on the life of Stuart Shorter and the book written by Alexander Masters Stuart: A Life Backwards), all have melodies that stay with the listener from first play. None more so, though, than Icarus, a languid, dreamy work containing some of Lucy’s most expressive singing, her vocals floating over the ethereal instrumental soundscape. Lucy says, in her matter of fact way “Icarus’s lover is left to drown as he chooses his aspirations over her”. Lastly, there is Velvet Sky, an anthem, almost symphonic in nature for a piece of music just 4.13 long, with a labyrinthine lyric full of word delights. Collectively, the songs here showcase Lucy Ward‘s consummate performance and creative songwriting abilities, her genuine and sparkling personality and stunning voice. The new album Single Flame is a shining statement of how far her talent has grown and developed in such a short time. Contemporary folk/acoustic duo Gilmore and Roberts combine award-winning song writing with astounding lap-tapping guitar, fiery fiddle and their trademark harmonies, creating a powerful wall of sound. Their third album The Innocent Left, recorded in London with producer Julian Simmons (Guillemots, Ed Sheeran, Albert Lee), explores many and varied topics but remains consistently bound by Gilmore & Roberts' passion for stories. From the steady groove of the intriguing Doctor James to the relentless pounding of Scarecrow, and Silver Screen's wistful introspection, the album encompasses elements of folk, bluegrass and rock while maintaining the Yorkshire-based pair's own distinctive stylings. Katriona Gilmore (from Knebworth, Hertfordshire) and Jamie Roberts (Barnsley and proud) met while studying at Leeds College of Music and began working together in 2006, releasing their first full-length album Shadows & Half Light two years later. 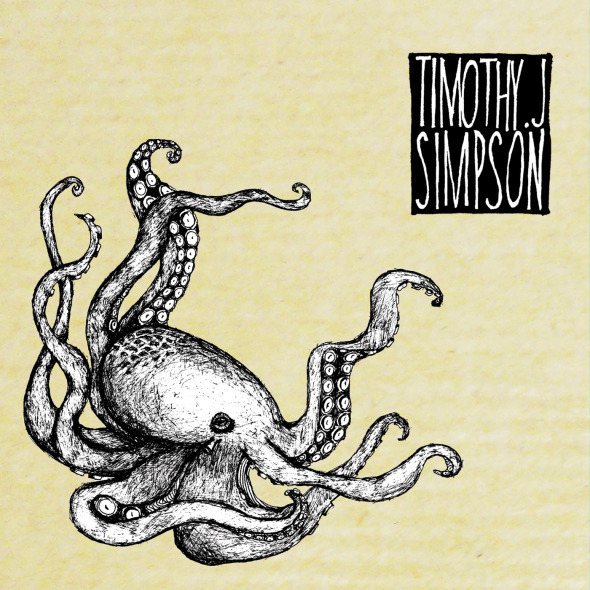 In 2010 the duo were nominated for the BBC Radio 2 Horizon Award and released their hotly anticipated second album, Up From The Deep, receiving national airplay. They also scored a 'Best Original Song' Hancock Award for Fleetwood Fair. Since then, the duo have toured with folk rock legends Fairport Convention and completed several headline tours in their own right, astonishing audiences up and down the country, as well as performing at some of Britain's largest acoustic festivals. Both are familiar faces to festival-goers nationwide from their previous projects - Gilmore with indie folk sensations Tiny Tin Lady, singer Rosie Doonan and more recently The Albion Band, and Roberts with young English traditionalists Kerfuffle. The album also includes a duet with James Mercer of The Shins on Living a Lie. Mann will support the new album with tour dates this autumn. Charmer was produced by longtime friend and band member Paul Bryan and recorded with Ryan Freeland (Ray LaMontagne, Bonnie Raitt) at Stampede Origin in Los Angeles. Bryan joins Mann on the album, among many other friends and collaborators including J.J. Johnson, Jebin Bruni and Jamie Edwards. Mann wrote all of songs on the album, though two, Living a Lie and Soon Enough are collaborations with Paul Bryan and Tim Heidecker, respectively. Mann began her solo career in 1993 with the album Whatever and made a name for herself through her independent success and the founding of her record label, SuperEgo. In addition to her solo work, she has appeared on many film soundtracks and composed the soundtrack for Paul Thomas Anderson’s much-lauded Magnolia. Since @#%&*! Smilers, Mann has performed for President Obama and the First Lady at the White House, appeared as herself on the hit indie TV series Portlandia and fast become an internet darling. Named one of The Huffington Post’s “13 Funny Musicians You Should Be Following On Twitter,” Mann has gained a diehard social media following for her quick wit and stinging observation, much of which is reflected on the new album. New album from Ben Glover, "one of Ireland's finest tunesmiths"
Ben Glover is back with a fourth album, as emotionally graceful and expertly Americana as his previous three. And with even more songwriting maturity, his Springsteen-esque qualities and healthy Dylan twinge even more present, the critics’ early premonitions of greatness are even more justified. Recorded in the heart of Nashville, Do We Burn The Boats was produced by Neilson Hubbard (Kim Richey, Glen Phillips, Garrison Starr) and features a track (Rampart Street) co-written by seasoned folk songstress Mary Gauthier. "I intended to record just five songs for an EP, but after three days in the studio we all felt that there was a momentum happening that we couldn't ignore. So we decided to go full steam ahead and cut ten songs and make an album," says Glover. "It all happened very quickly and organically, but I’ve learned that sometimes the creative process takes on a life of its own and when it does it’s best to follow it’s direction." Glover has garnered rave album and concert reviews from across the globe and has toured extensively both as an opening act and a headliner. In the past year his touring schedule included dates in Belfast, London, Glasgow, Edinburgh, Dublin, New York, Brussels as well as dates at the famed Hotel Café in Los Angeles and sold out shows in the Nashville’s legendary Bluebird Café. He hails from Glenarm, Co Antrim, a small coastal village 30 miles from Belfast, and splits his time between there and Nashville, Tennessee. He traded a law degree in for a music career and by all accounts it was a move that has paid off. Glover has toured and/or performed with Vince Gill, Buddy Miller, Jim Lauderdale, Mary Gauthier, Jason Mraz and Tift Merritt. 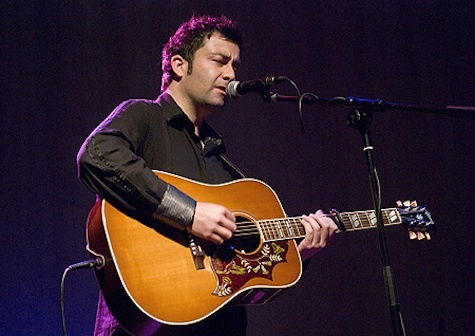 His songs have been used in feature films such as Finding Joy and in hit webisode series Adults Only; he also penned the theme song for BBC N.Ireland sports programme The Championship.